Are You Anxious for Nothing? The index card’s backside was barely visible. The back reflected enough of the white, however, to create a three dimensional effect on the mammoth-sized mirror. The card appeared to be popping off the glass in springboard fashion, almost as if it was floating in air. That crazy tape. It always does that. I was too cheap, maybe thrifty, to buy double-sided tape. Single-sided tape, hand-rolled in backwards fashion, had to do. My hand smoothed across the card, pushing extra at each of the four the edges. Just to be sure. My eyes caught the hand-written words quietly sitting on the light, blue lines. They awaited a reader. They awaited me. I let out a sigh. My eyes scanned the next line, index finger following each word. I whispered the words to myself. I’m not going to handle this one like the others. There were only a few sunrises left. Moves were never easy. Ours was within reach. But I was determined not to handle this one as the string of moves before. A ball of nerves and anxiety for the unknown both took part in day-to-day life during our conglomerate of military moves. Inevitably I’d lose my temper right along with the control the moves so hastily devoured. If ever I would dip into a down period, almost a depression, it was bound to happen during a move. I hated it. Losing control was never easy. After all, it was really about control. The 3×5 card was my grip on sanity, a release for an anxious heart. It was a lifeline to God. My eyes devoured every curve and straight line on that card until I knew it well. The Scripture was written on my heart. I needed His truth to see me through. Many of us do. In nothing be anxious, but in everything, by prayer and petition with thanksgiving, let your requests be made known to God. And the peace of God, which surpasses all understanding, will guard your hearts and your thoughts in Christ Jesus. We may have moves or other changes in life that come and go. Those changes have potential to uproot control, to stir our anxious heart. But as we choose peace over anxiety, as we take our change, our troubles, our life to God in prayer, something changes. The heaviness lifts. Peace settles in like a welcomed overnight guest. We place our trust in God, not anxiety. It’s somewhat like reaching up and grabbing our Daddy’s hand, allowing Him to lead us down the path. It might take diligence, consistency too. It might feel uncomfortable at first, but that’s okay. I had much anxiety to offer Him. Many were even repeats. He heard my pleas many times a day. He’ll hear yours too. He loves you. Whenever thoughts go wild, when anxiety starts to stampede, try saying out loud, “Nope. I’m not going there.” Head to your “mirror”, with that Scripture card intact, and repeat Philippians 4:6-7. Offer those thoughts in prayer, in supplication, in thanksgiving. And watch the peace of God guard you well. He’s faithful. Be determined to be anxious for nothing, my friend. Our Daddy has you. You’re invited! Linking hands in the blogosphere to lift up the name of Jesus with these beautiful gals: Intentionally Pursuing, Purposeful Faith, Testimony Tuesday, Jennifer Dukes Lee, Holley Gerth, Suzie Eller, Tracie Miles ( #stressless), Dance with Jesus, and Counting My Blessings. …to #Lordtodayprayers on Facebook. We’re praying together most weekdays. You’re invited. Need a speaker? I love to encourage folks in their walk with Jesus. You can find more about my speaking and get a little sneak peek here. 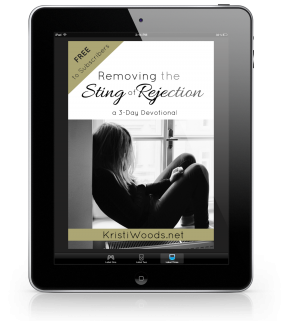 Dear Kristi … I do believe you wrote this just for me today. Thanks for listening to His prompt. Truly. I love it when God works “behind the scenes”, Linda. Praise His holy name. Beautiful post, Kristi! I’m choosing peace over anxiety and taking my mess to Him in prayer today. Thank you. 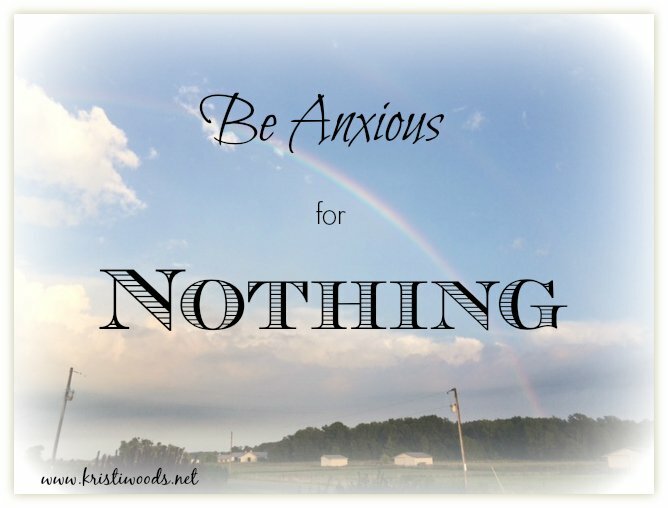 Be anxious for nothing… a timely truth for today. Bless you! Following you at Kelly’s today. Thank you, Julie. Peace over anxiety is a win any day. You go, girl. Love this post, it really speaks to me..I’ve had to move in my life several times–certainly getting uprooted stirs the anxiety pot! But that verse, one of my favorite, has helped me in so many ways during times of change. You’re just reminding me again the power of that prayer in building our faith! I was drawn to your title on IntentionalTuesday today! Hi Kathy. You “get it”. So glad God does too and has a better way. You’re a blessing. Kristi, verses on index cards are my favorite, especially THESE verses! I’m so thankful God doesn’t stop us, mid prayer, and say something like, “Sorry, already heard that one already. Move along now.” I also love how the Message puts the last part of verse 7: “It’s wonderful what happens when Christ displaces worry at the center of your life.” Thanks for this encouraging post! I love that version of the message too, Lois! Love those index cards, Lois. And how He displaces worry. Oh yes! Oh, the inner-talk…it can be a downer. So glad we have a guard to ward it off. Thanks for visiting, Brenda. 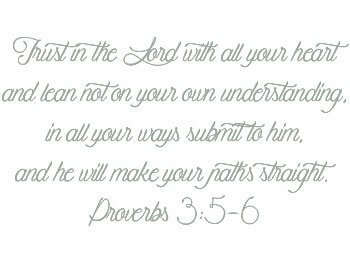 This is one scripture we should all write on our hearts. . . just thinking it through is ushering in peace right now. Love it, Kristi. I can’t imagine all of the emotion that goes on with each move and each temporary settlement. Glad you’re parked for a while! Amen. Thank you for sharing this beautiful simple reminder. Amen. I’m with you, Bomi – amen. 🙂 Your visit is a blessing. Thank you. I feel as if I’m always anxious about something — large or small! But you are so right about choosing peace over anxiety always somehow changes us as we trust what God says he will do — give us the peace that we somehow just can’t understand! Love that! Trust will do the heart good. His peace is worth every grip release, Valerie. Thanks for visiting. The idea of God’s peace standing guard over my soul. Oh, how I needed that image today. Thank you for your words of encouragement, Kristi. I’m blessed we’re #livefree neighbors too! It does seem oh so strong, doesn’t it, Heather – peace standing guard over our soul. Amen to that for this Friday! Thanks for visiting. So, so grateful, Crystal. I’m praising right alongside you. That’s my go-to verse for the Thanksgiving season! For me it takes “prayer and supplication” to get to the thanksgiving part, but am grateful for God’s patience with those of us who have the Eeyore-gene! It’s a wonderful go-to verse, Michele. Blessings! My mind is swirling with “what ifs”. I was convicted by your words to “not put trust in anxiety”. Good morning, Karen. We have a faithful God whose words build life…even in the midst of stress echocardiograms. Whew! Lord, thank you for Karen. You know her heart, both the spiritual and the natural. I pray today, even in the midst of a heart test, that your peace will guard both her mind and heart. Father, I pray for trust to drive her bus. In Jesus’ name, amen. Hugs and prayers coming your way from a fellow care caster. The key to being anxious for nothing lies in the second half of the verse… but with prayer, petition and with thanksgiving, present your requests to God. We can’t have peace if we don’t learn to pray. Thanks for this great post! Enjoyed your post! 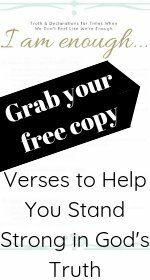 One of my favorite verses is the one in Philippians you mentioned. Connecting with you from “A Spirit Kissed Soul” with Tai. Blessings to you! I’m standing on this one right now, Kristi. I’m not going down that road of anxiety today. Claiming this precious promise from God as I enter into the week ahead. Thank you dearly, sweet friend!